Brand Aid is based on three pillars: a brand, one or more aid celebrities, and a cause. Brand Aid is the combined meaning of “aid to brands” and “brands that provide aid.” It is aid to brands, a mechanism that helps selling products, profiling a brand in the media, and building brand value. It is also aid financing that is provided through branding. Corporations attach their name to a good cause and donate a portion of the profits that arise from the sale of specific products. Celebrities mediate the communication between brands, consumers, and international development aid. As a response to the crisis of legitimacy in international aid to Africa, Brand Aid also helps to rebrand aid itself and aid to Africa in particular. We explore this phenomenon in our book Brand Aid: Shopping Well to Save the World (University of Minnesota Press) via the case study of Product RED. 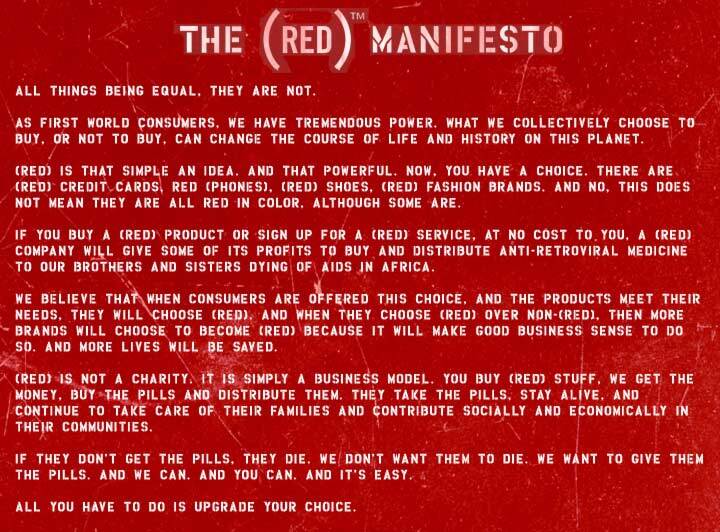 The Product (RED) initiative was launched by Bono the Irish rock star at the World Economic Forum in Davos in 2006. Product RED is ‘a brand created to raise awareness and money for The Global Fund to Fight AIDS, Tuberculosis and Malaria by team­ing up with iconic brands to produce RED-branded products’ (see http://www.joinred.com/). With the engagement of iconic brands, such as American Express, Apple, Emporio Armani, Gap, and Starbucks, consumers can help HIV/AIDS patients in Africa. From an Emporio Armani RED watch to a RED iPod TM and from (Starbucks)RED whole bean coffee to a (RED)GAP sundress, a percentage of the profits from the sale of all RED co-branded products is contributed by the ‘iconic’ partners directly to The Global Fund. In essence, aid celebrities are asking consumers to “do good” by buying iconic brands to help “distant others” —Africans affected by AIDS. This is very different from “helping Africa” by buying products actually made by Africans, in Africa, or by choosing products that claim to have been made under better social, labour and environmental conditions of production. The Global Fund is an international mechanism to channel aid financing to developing countries, and it controls the second largest pool of donor funds in the world (after the UN itself). Companies pay a licensing fee to RED and commit to a multi-year partnership. As of August 2011, RED had donated over $175 million to the Global Fund. RED grants are made through the Fund’s standard disbursement processes and have been dedicated to the Fund’s best-performing programs for AIDS in Africa – so far, funds have been disbursed to Ghana, Lesotho, Rwanda, South Africa, Swaziland and Zambia. Four companies can claim the title of ‘founding member’ of the RED initiative: American Express, Armani, Converse and Gap. Their RED product lines were made available soon after the RED launch in Davos – in March and April 2006. Motorola launched its range of products in May 2006 (but left the initiative in late 2008). Apple joined the initiative in October 2006, followed by Hallmark in 2007, Dell and Starbucks in 2008, and numerous other companies in subsequent years. The RED product lines sold by these companies are not cheap trinkets, but are not prohibitively priced for Western middle-class shoppers. Most products range in price from $50 to around $200, with exception of some more-expensive Emporio Armani items and Dell computers, and some cheaper Gap accessories, Hallmark cards, iTunes gift cards, Penguin books and Nike shoelaces. Both Hallmark and Con­verse allow customers to design and/or customize their RED products, aligning themselves with the ‘consumer participation’ philosophy embraced by the RED initiative through its RED blogs.